After three weeks of waiting, a box from Amazon arrived yesterday. 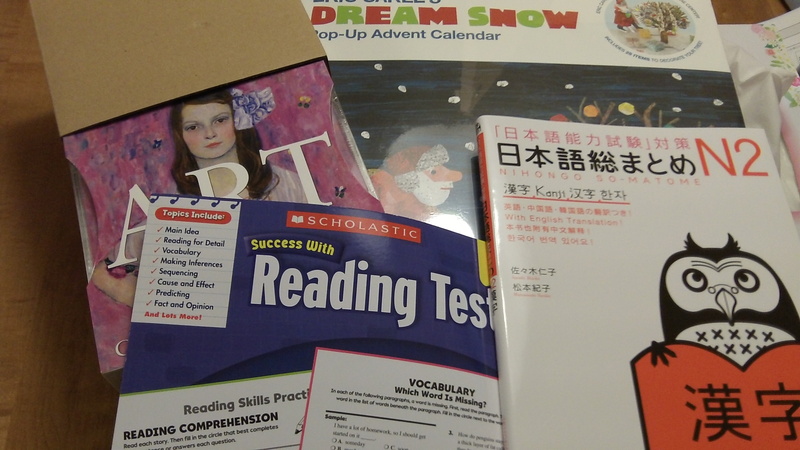 It contained a 2014 MET artwork calendar, an Eric Carle advent calendar, a new Scholastic workbook, and a kanji book for me. I also ordered a journal for my son, but that is what kept me waiting for three weeks. Honestly, I may never get the Journal. This new one is cut and dry. What does “gulp” mean? Why, yes, my son, it means “to drink.” Bravo, darling, bravo. Now go gulp down your juice and finish getting ready for school. « Sorry to drop everything and run!